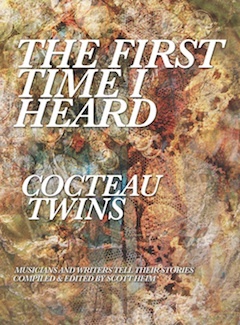 Editor and author extraordinaire Scott Heim invited me to contribute an essay to the book THE FIRST TIME I HEARD…COCTEAU TWINS, which is a part of a series about music geekery, written both by writers and musicians. I’m chuffed to appear in the book with David Narcizo (Throwing Muses); Ian Masters (Pale Saints); pianist and Cocteau Twins collaborator Harold Budd; band collaborator and live guitarist Lincoln Fong; Pete Fijalkowski (Adorable); Anka Wolbert (Clan of Xymox); Sean “Grasshopper” Mackowiak (Mercury Rev); Meredith Meyer; Mark Van Hoen (Locust, Seefeel); Paul Anderson (Tram); Paul Elam (Fieldhead); Rebecca Coseboom (Halou, Stripmall Architecture); Michael Cottone (The Green Kingdom); Sarah Jaffe; Antony Ryan (Isan); Dean Garcia (Curve); Kurt Feldman (The Pains of Being Pure at Heart); Erik Blood; Annie Barker; John Loring (Fleeting Joys); Guy Fixsen (Laika and co-engineer for My Bloody Valentine); Emily Elhaj (Implodes); Carlo Van Putten (The Convent, White Rose Transmission); Eric Quach (thisquietarmy); Ryan Policky (A Shoreline Dream); Matthew Kelly (The Autumns); Steve Elkins (The Autumns); Ryan Lum (Lovespirals); Michael Savage (The Fauns); Amman Abbasi (The Abbasi Brothers); Eric Loveland Heath; Ben Mullins (Midwest Product); Keith Canisius; Michael McCabe and David Read (Coldharbourstores); and writers like Emily Franklin, Alistair McCartney; Tony Leuzzi; and Sommer Browning. It’s an ebook, available both on Kindle and Nook, and soon to appear in iBooks….